Made by Wade have just delivered a short documentary about street artist Stewy, which was screened as part of a day showing the creation of one of his works at the People’s Museum in Manchester. That image, of iconic early feminist Mary Wollstonecraft, was featured in a BBC programme on the suffragettes and their legacy. A clip from that programme, Suffragettes Forever: The Story of Women and Power, starts off the film. Stewy’s work focusses on stencilled portraits of famous figures in settings that are meaningful to them. For example, his Dylan Thomas piece is on a wall in Laugherne, the town where the poet spent the last four years of his life. Meanwhile, Manchester is home to portraits of hometown icons like Tony Wilson and Frank Sidebottom. The documentary features an exclusive interview with the reclusive Stewy, shot in a burnt-out garage somewhere in Bristol. We’ve made sure that his identity remains a secret. Stewy stresses that interest should be shown in the art rather than the artist. Dominic and Made By Wade have followed and documented Stewy since his first work, a cheeky stencilled pigeon, appeared in Shoreditch in 2007. Since then he has gone from strength to strength, and his art is enjoyed and embraced by the communities in which he works. Unusually, he seeks permission before spraying. This explains why works such as his Wollstonecraft, which is on the side of the Unitarian chapel in Newington Green where she lived and worked, has become a part of the scenery of the area rather than simply being painted over as graffiti. 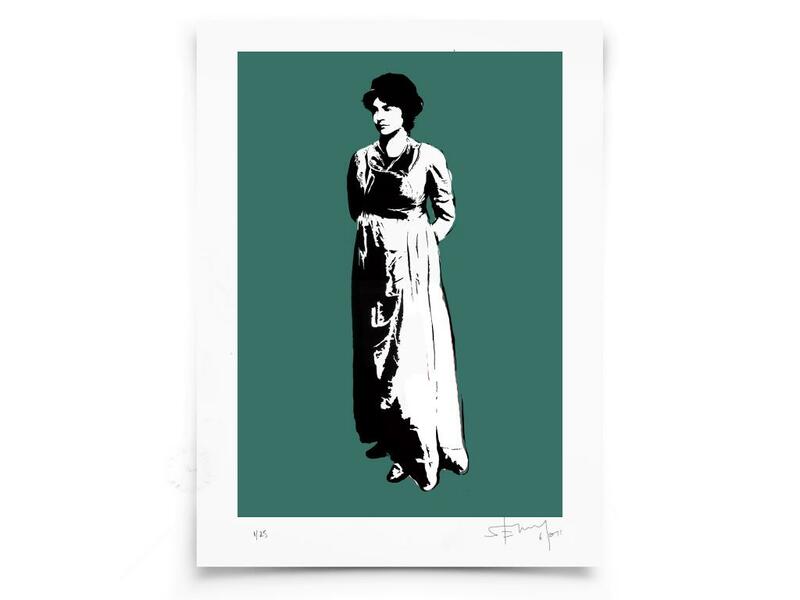 As part of the show, Stewy also created a new edition of his Wollstonecraft image, with a green background as a nod to the locality in which the original is sited. Following the Manchester screening, the documentary has been shown at Bluescreen in Bristol, with further excursions planned this summer. Keep it locked to Made By Wade’s news page for more info on where you can see this film on the big screen. Now for a musical interlude, as part of Made By Wade’s intention to both entertain and educate. Please enjoy Like Soldiers Do by Billy Bragg, as featured in the documentary.